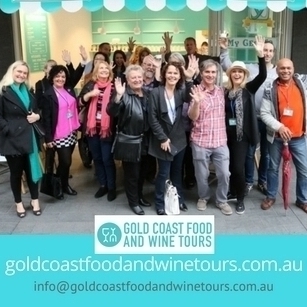 The Gold Coast offers a wide variety of markets that are guaranteed to please. 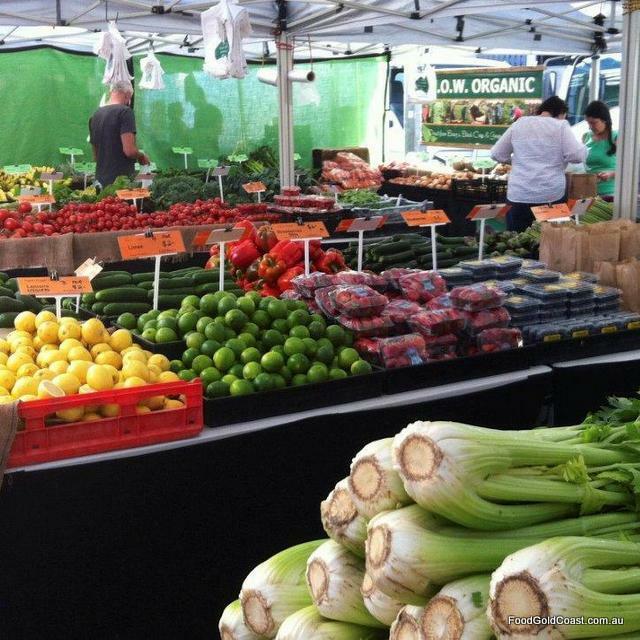 Gold Coast markets offer residents the chance to purchase food directly from farmers and producers, to experience our growing arts culture, and to spend social time with family and friends. Broadbeach: Old Burleigh Road, Kurrawa Park. 1st & 3rd Sundays of every month, 8am – 2pm. Burleigh: The Esplanade opposite 1st – 3rd Ave., Burleigh Heads. Last Sunday of every month, 8am – 2pm. Coolangatta: off Marine Parade, Coolangatta. 2nd Sunday of every month, 8am – 2pm. Local residents may be tempted to overlook their local art and craft markets, but they really shouldn’t. In fact, they’re some of the most diverse markets on the coast, with stalls featuring lots of unique handmade goods. All three of these markets are held beachside along the grassy verge between the shops and the beach, making them our most picturesque markets. Children play on the jumping castle, owners walk their dogs, and families and couples intermingle, browsing in a relaxed atmosphere. 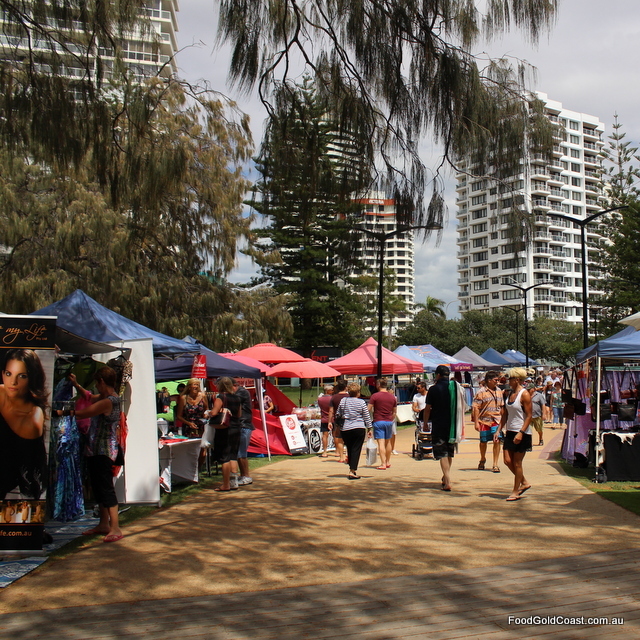 At the Broadbeach market, we see handmade toys, jewellery, leather bags, clothing and beachwear, bonsai, honey and other produce. There is also a good supply of food including Dazarro BBQ, Dan’s Dim Sim (which I pick up for breakfast) and sweet treats such as poffertjes, churros and CrêParis’ crêpes. 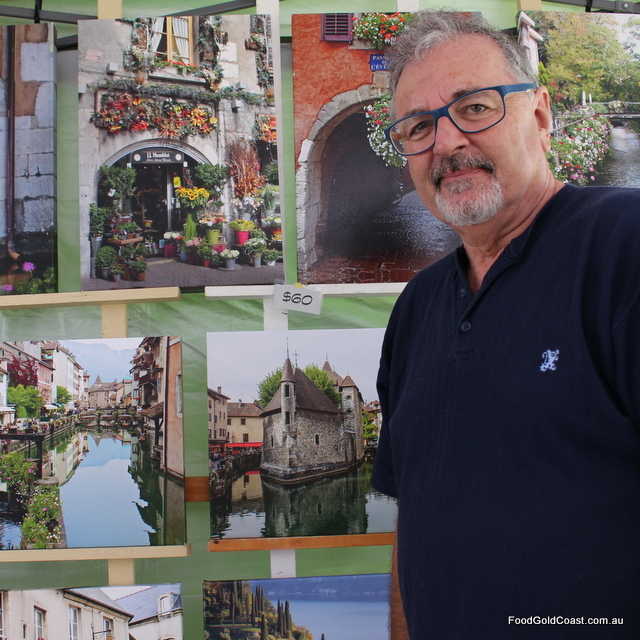 What really catches my eye are a couple of photography stalls: Peter Bate, who documents his travels through France and Italy (his canvas prints are also available at the Coolangatta markets) and Peter Stagg, whose ‘beach portrait’ stall has been a stayer since this market first opened twenty years ago. Each one of his photos holds a story all its own. Waves pound onto the sand just beyond us – such a beautiful setting to tell a story. Gold Coast Arts Centre, Bundall. Every Sunday, 6am-11am in summer; 7am – 12noon in winter. The move to the Gold Coast Arts Centre has been a good one for these markets. Bundall Farmers’ Markets spreads out from the lobby to the lake, stalls of fresh produce and gourmet delights brimming with vegetables and fruit straight from growers, fresh meat and fish, specialty foods, olives, cakes and slices, baked goods and bread, smallgoods, dips and biscuits, jams and pickles, and other gourmet delights as well as a few organic beauty products. There is plenty of parking close by, and extra seating on the Arts Centre portico as well as around the back behind the Arts Café. It’s trolley heaven, with a mixed clientele of shoppers, from young families to retired couples. Like many families, we make market shopping a Sunday family excursion, stopping to chat to stall holders or friends. We grab a coffee from Kubil’s and linger over gozleme, bagels, sausages or gyoza for breakfast in the undercover area, dining to the sounds of live music. This is the closest many of us city dwellers get to the holistic ideal of buying produce direct from the producer or grower. Note that in summer the markets open and close an hour earlier than in winter. Burleigh Heads State School, Burleigh Heads. Every Saturday, 7am-12 noon. 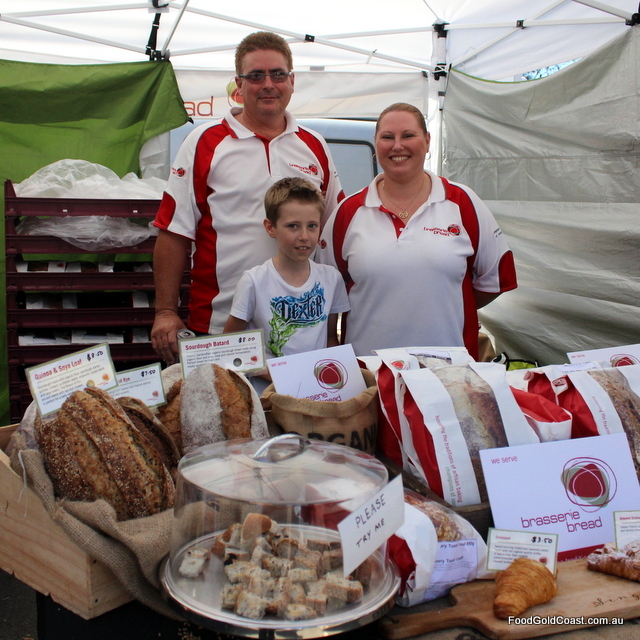 Besides fruit and veg, Burleigh Heads Farmers’ Markets offer a different blend of produce and wares to other markets. There are gourmet foods and deli items, artisan bread and pasta, meat and fish, fresh flowers and plants, as well as handmade crafts and clothing, collectibles and some bric-a-brac. There’s a good range of authentic global food to choose for a quick meal or takeaway: handmade gyoza without MSG (fantastic! ), fabulously thin gozleme (from Gozleme World) served with carrot dip and hummus, German bratwurst from the Kransky Brothers, raw desserts, fruit-filled frozen yoghurt as well as coffee…to name a few. 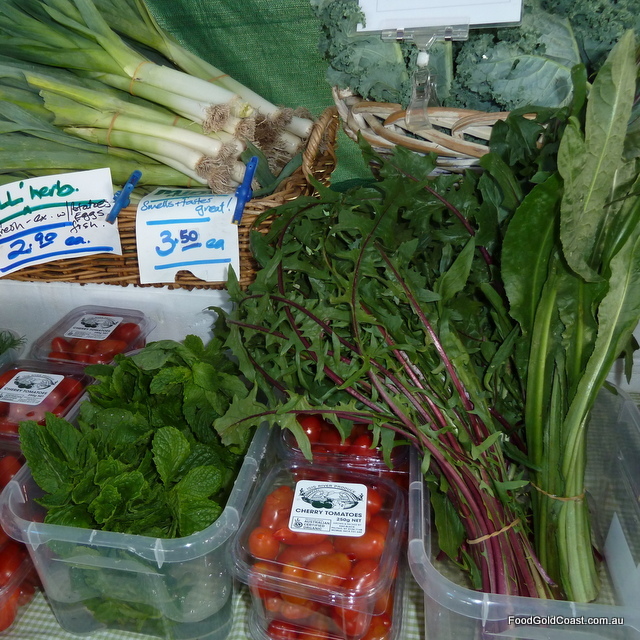 Best of all, we love the organic section of the market, including organic coffee, plants, and vegetables. The markets are set on a grassy flat on the school grounds, flowing into undercover areas of the school, giving it a country feel right in the middle of a beach suburb. With plenty of seating and lots of free parking on the oval beside the markets, it’s a great way to begin the weekend; a real social occasion. Corner Gooding Drive and Manchester Road, Carrara. Every Saturday & Sunday, 7am – 4pm. 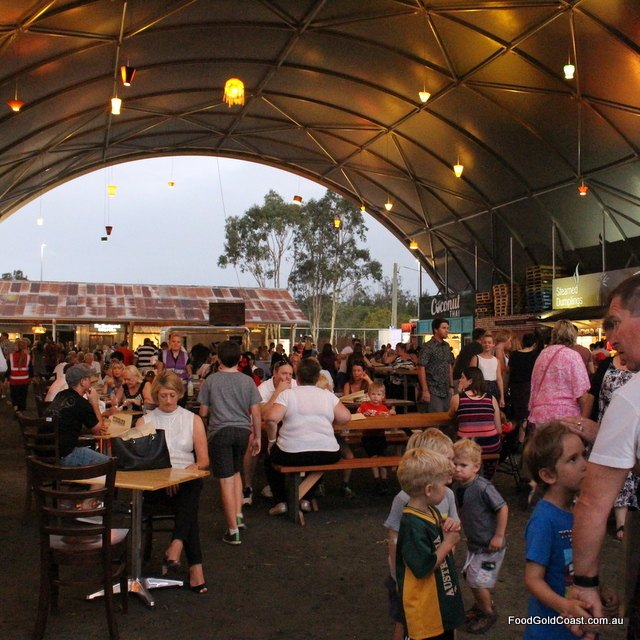 The largest permanent market in Queensland with over 400 stalls, the Carrara Markets is open every weekend over two days. Haven to the fabulous and flimsy, the terrific and the tacky, you can buy anything from bedside lamps to carpets, from paintings to tools, from clothing to kitchenware and plants to trinkets. Whether you’re a tourist looking for trinkets or locals picking up some plants for the garden, you’ll find treasure (as well as a bit of trash) at Carrara, be it handmade, imported and second-hand. The food department covers produce, pantry items and multicultural food to go. After all, someone has to feed the market goers as well as the stallholders every weekend! Apart from a fair range of vegies (some the cheapest on the coast), there are providores (such as Carrara Spices, Backa Smallgoods and Taswegian Deli) and food to go – ChurroCafe, Fingers and Bones, Idospices, and the very popular Silo Café, whose excellent coffee and retro sized serves are great tummy fillers. “It’s all very relaxed here,” Carrara bakery owner Wayne tells me, and it seems that way, with sellers chatting to locals and cracking jokes. Everything’s in Wayne’s shop is made from scratch and baked on site, which brings enough return customers to buy 50 dozen pies on a winter weekend. Now that’s a lot of tummies filled! “Every weekend day at 2pm we reduce everything to half price,” Wayne tells me. That’s a great tip for a weekend lunch! Young and Davenport Streets, Southport. 1st Saturday of every month, 4pm – 10pm. Come and enjoy an authentic Asian food experience with your family and friends at the Chinatown Street Markets. 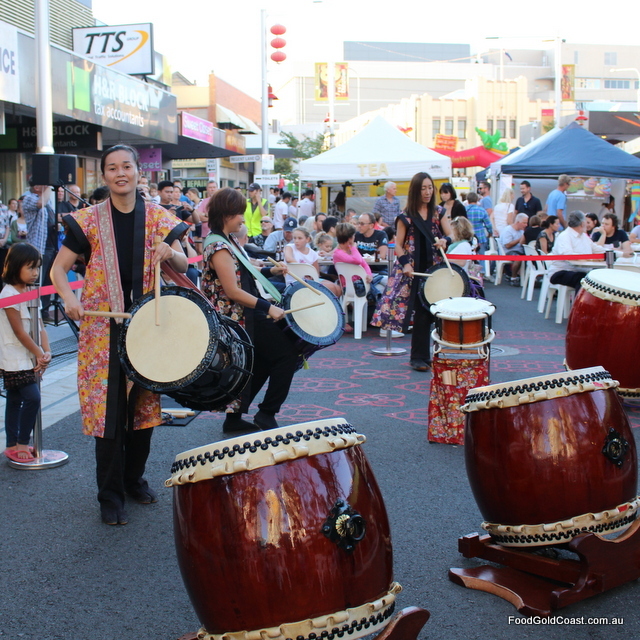 On the first Saturday of each month, the Chinatown precinct is transformed into a vibrant street food and entertainment scene as our first Asian-inspired food market takes over the streets of Southport. Cooked in front of you while you wait, you can taste your way through Asia with a selection of cuisine from Malaysia, China, Japan, Korea, Thailand and more. The streets come alive with market stalls from 4pm to 10pm, and local retailers and restaurants extend their trading hours during market times. Best of all you can catch the G:Link, the light rail system, into Southport and get off in the heart of the precinct! The Boulevard, Carrara. Open 3pm to 7pm every Thursday. When we’re going away for the weekend, Emerald Lakes Market is one of those quiet little markets we can pop into on the way home, pick up a few fruit and veg to tide us over and grab a quick meal for a tenner each and we’re on our way! With delicious French cheese for sale from Le Fromage Yard, pizza, crêpes, French patisserie, Thai food, meat and hot and cold seafood as well as fresh produce, all the bases are covered. You can not only do your late night shopping so you can have your weekends free and have dinner in the same outing, you can also take your dog for a walk. “Many people who live here have a small dog,” market manager Terri tells me, “so a pet-friendly market makes a lot of sense.” Fortunately, the owners have their dogs well trained. The market is spotless! Want to check out undiscovered design talent on the coast? Then these are markets we can recommend. Run by the Gold Coast Design Collective, it’s a nursery for budding artists, designers and creators. Jewellery, clothing, homewares, handmade cards and stationery, children’s clothing and giftware… there were lots of stalls holding that special gift for just the right person. Some artwork is complete, such as Holly from 2H Artistry’s magnificent airbrushed surfboards, while others, like ChalkO’s shabby chic distressed paint and instructions, allow you to create your own upcycled arthouse furniture. 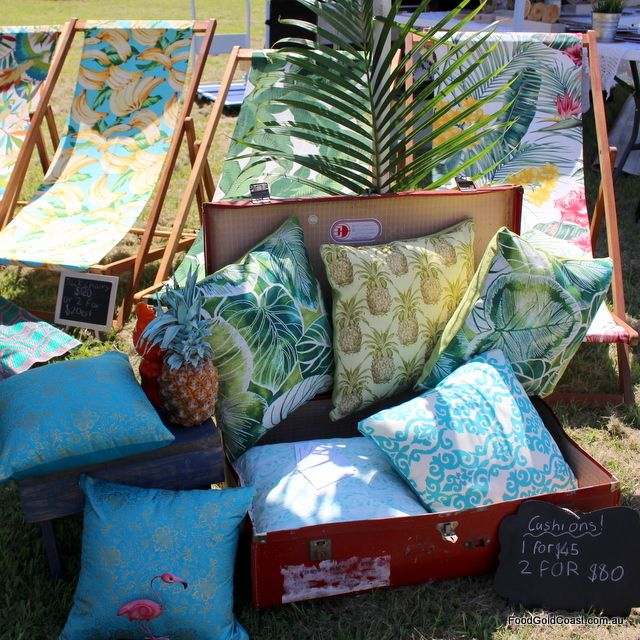 We pick up some hand painted lead-free crystal glasses from Kel Hinds Art, lust after Claudiaeve Designs’ floral cushions and deckchairs, and check out the Burleigh Roadsters’ Tiki Hut wares. (If we knew someone setting up a tiki bar, the set of six shot glasses would be just the thing!) When we visited, there were a number of food stalls set up around the stage, The Dapper and Chic a new one to us, serving Beer battered king prawns in Cajun spice, and Baton Rouge pork slow-cooked in bourbon stuffed into a baguette. Oh yum! Miami State High School, 2137 – 2205 Gold Coast Highway, Miami. 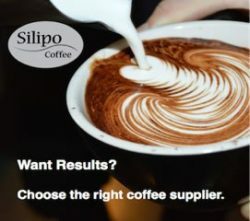 Every Sunday 6am – 11.30am. Leave your mobile phone at home, relax, and join the growing number of Gold Coasters who enjoy an organic shopping experience every Sunday, 6am – 11.30am. Helensvale State High School, Helensvale Road, Helensvale. Every Saturday, 6am -11.30am. 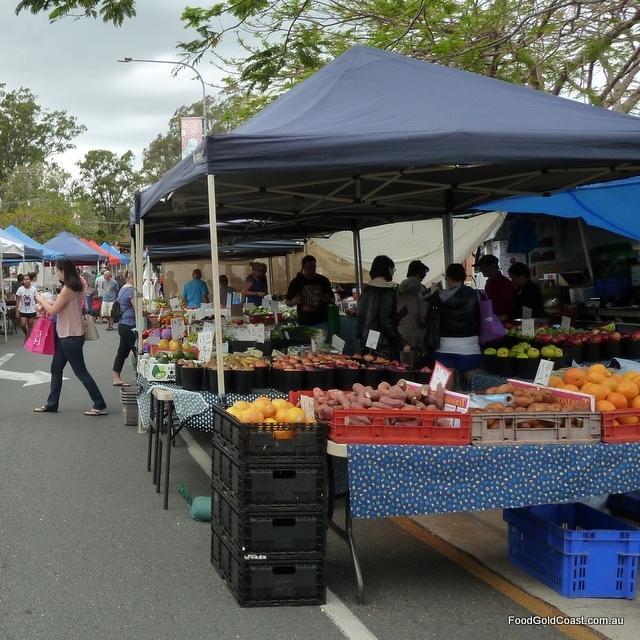 Although completely shaded by canopies, it’s best to visit Helensvale Markets early during the summer months. 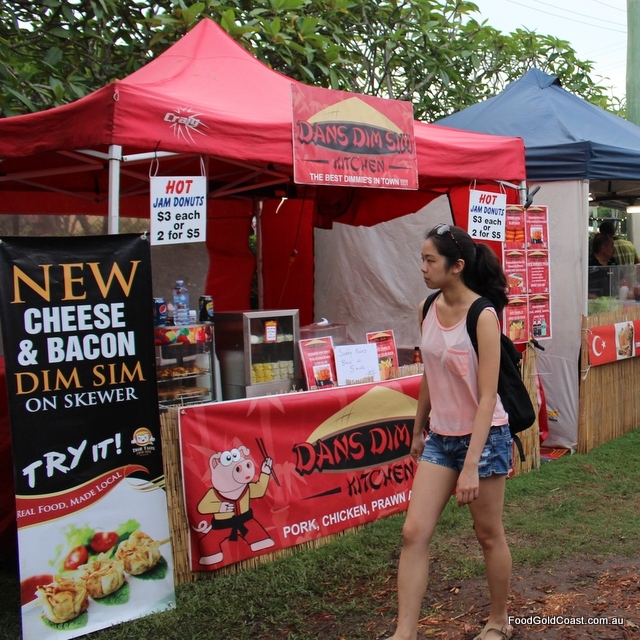 Held on the basketball courts at Helensvale State High School, this market is well worth a visit because of the stalls which are only located at this market. There’s a fair range of produce and some of our favourite stalls (Kubil’s Coffee, Kransky Bros., The Sandwich Bros., Tender Calamari, The Hungry Hungarian and Gozleme) but we find other treats as well: Frangipane Bakery & Patisserie (whose pies have won a bronze medal in a national competition; also look for their Lemon tart, Dutch apple tart and the original Nimbin Aquarius Bread that fed the nation’s hippies for years), Primavera Foods (a Gold Coast company specialising in traditional Chilean and Argentinian foods, such as chimichurri and alfajor, shortbread with a caramel filling – yum!) and Brasserie Bread, a local baker. 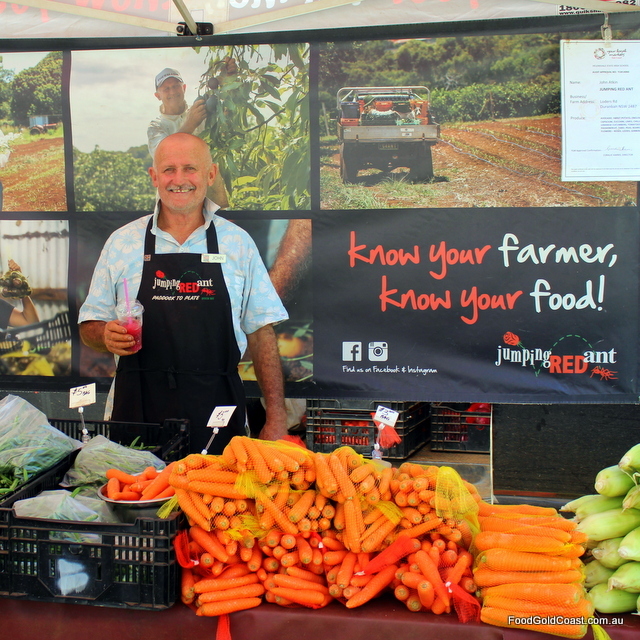 Stop on your way out at Jumping Red Ant, a local organic farmer from the Duranbah Tweed area. That’s a few meals sorted! St Andrews Ave., isle of Capri, Surfers Paradise. Every 2nd & 4th Saturday, 8am – 1pm. Isle of Capri Markets is a small market aimed at local residents. 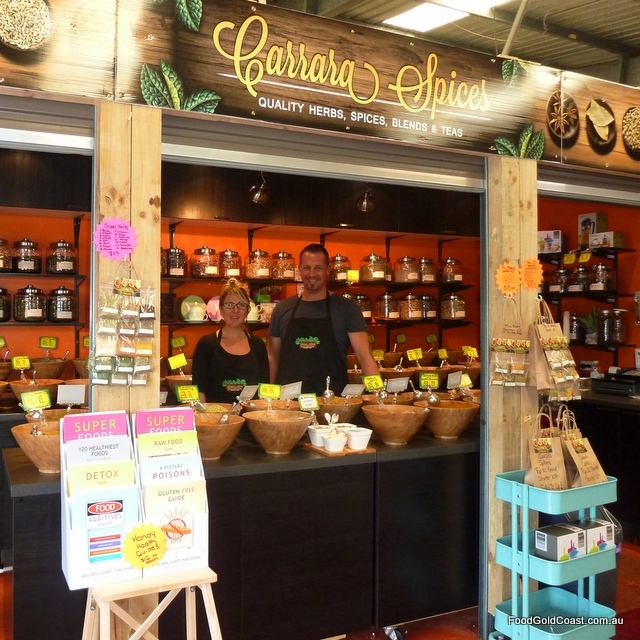 It offers fresh bread, seafood, meats and smallgoods, vegies and cakes, plants and homewares, as well as some craft. Bring your dog and small children, as there are activities for both! If you’re travelling from another suburb, plan to visit the markets before you check out the lunch options at Capri on Via Roma. Country Paradise Parklands, 231 Beaudesert-Nerang Road, Nerang. Every Friday, 5pm – late. The name of these markets may seem random until you realise that it’s an acronym for ‘It takes a village approach’. It’s a name which fits perfectly with these community-minded markets. Since the Gold Coast City Council bought Country Paradise, the beautiful parklands have become home to nine community groups, including men’s and women’s ‘sheds’, Nerang Community Gardens, and OzHarvest. 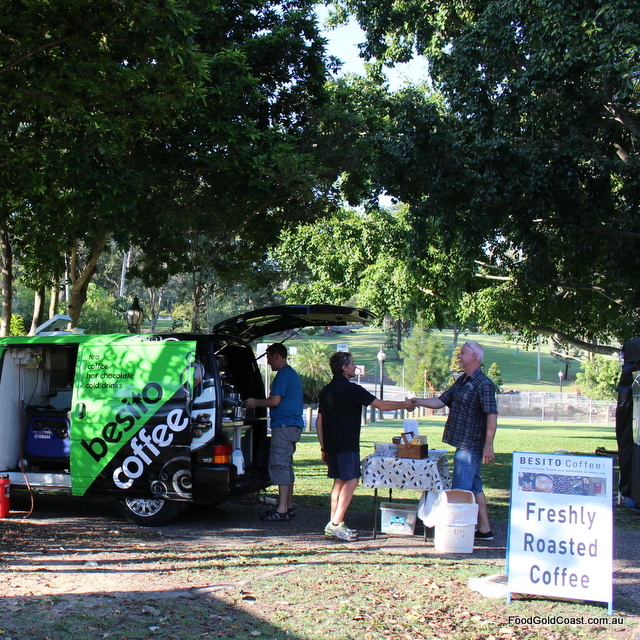 There’s a lovely feel to these markets, run for the GCCC by Nerang Country Paradise Association. Verandas and several huge Moreton Bay figs provide shade for the food stalls serving woodfired pizza, pulled pork rolls, Thai curries, BBQ and coffee. There’s a portable stage set up and a bar serving drinks at close to cost ($2.50 for wine and $3 for beer). While this market is still small, its picturesque location gives it incredible potential for growth. This is a market we could happily visit for an inexpensive Friday night dinner, a few drinks and live entertainment. Without great expectations, we drove out through cane fields to Jacob’s Well for the monthly market, held beside the Bayside Tavern. The market meanders around buildings, more extensive than it first appears, but there’s plenty of parking around the streets nearby. In our eyes, this market is well worth a visit because stalls hold completely different goods to what we usually see. There’s some produce, bric-a-brac, candles, books, homewares, and herbs and spices, but more importantly a number of vendors sell items they have hand made themselves. 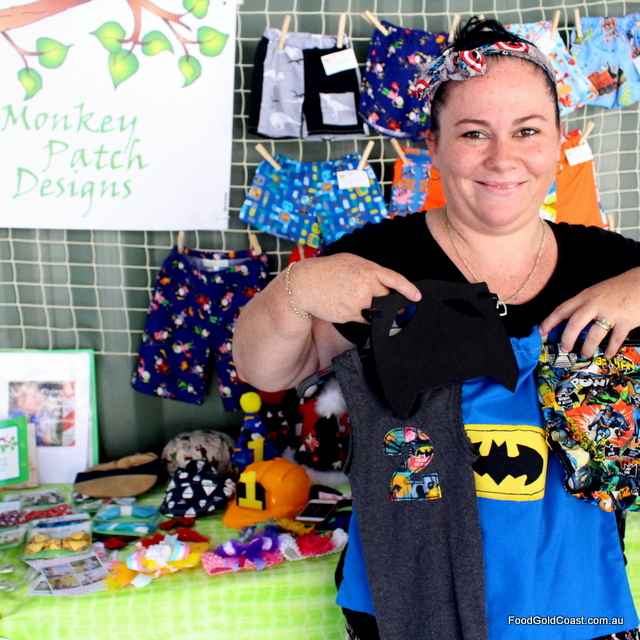 Local designers Tara Colledge and Jody Rowlands of Monkey Patch Designs make themed and vintage baby outfits for birthdays and special events. “We love these markets because there are no stall fees and everyone is local,” says Tara, adding that their stall provides a display for people to see their outfits, also sold online. “There are a large variety of stalls here because the managers don’t double up. Items are very reasonably priced for handmade goods and everyone is so creative,” she says. 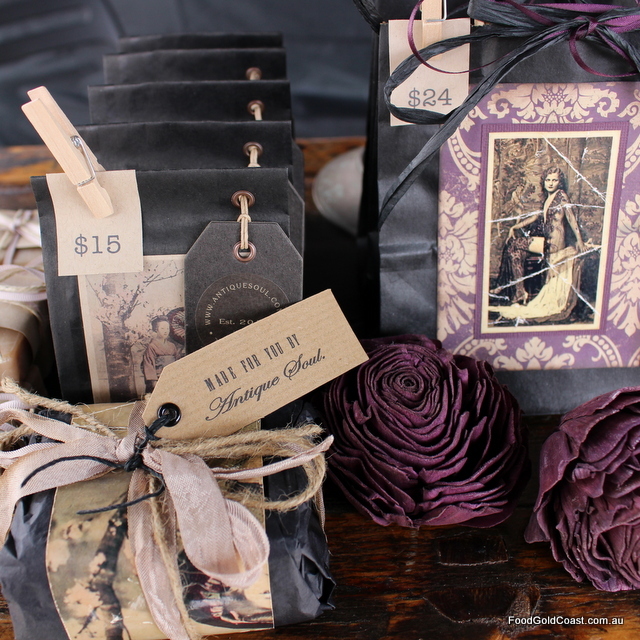 These sentiments are echoed by Foxy M. Creations who custom make gorgeous cards and wooden crafts. We came away from these markets with a bag full of goodies. Situated in the Marina Mirage courtyard, these markets are an easy choice due to their shade from the elements as well as undercover car parking. This makes them best suited to housing cheese, chocolate, dairy and fish – products which are less available at other venues due to temperature restraints. 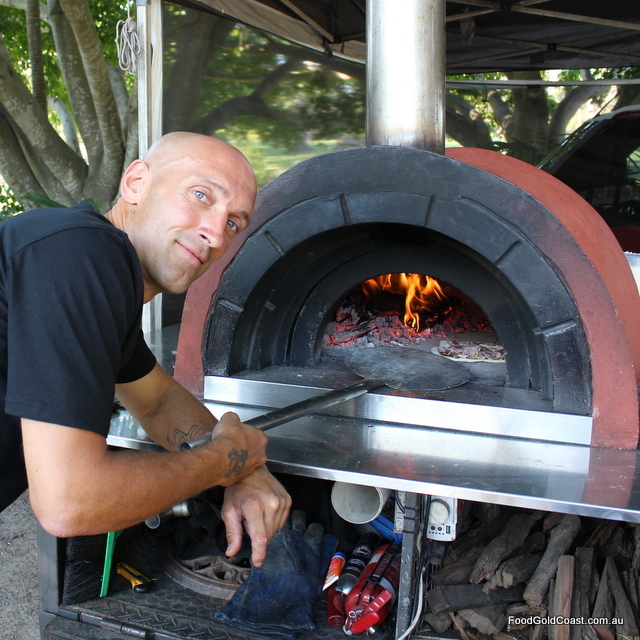 We pick up a delicious pie from Amore di Cucina (with a filling of 12 hour slow-cooked Angus beef – they also carry frittata, dips and Kingaroy cheese), brownies from Mel’s Brownies, homemade pesto and empanadas from LatinOz, olives from Cominos, as well as some tuna from Providore’s stall. Marina Mirage Markets is a great all-weather market to visit for gourmet and food intolerance foods, everyday produce, bread, pantry and freezer items. It’s also one of the best markets to visit for Christmas treats. 23 Hillcrest Parade, Miami. Wednesday Tapas Club 5pm – 9pm; Street Food Market Friday 5pm – 10pm & Saturday 4pm – 10pm. There’s a real family feel happening in this now twice-weekly Street Food Market (Friday and Saturday nights). 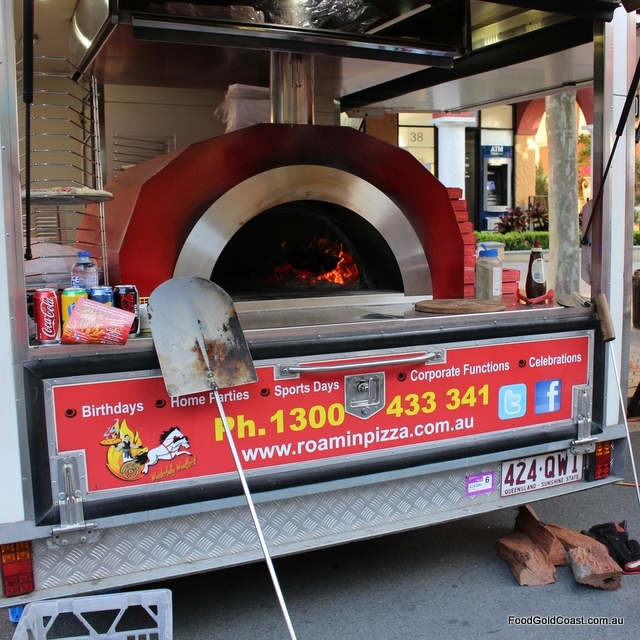 Situated in the laneway running through the arts precinct of the Marketta, the event is part street food market, part pop up, part festival of food, part permanent craft and clothing stalls, part live music event. Street food is trendy, and judging by the turnout and crowd enthusiasm, you could have mistaken it for an annual foodie event in a very hungry town. Celebrating our ‘United Nations’ of food French, Hungarian, Mexican, Turkish, Spanish, Indian, Thai, Brazilian, Venezualan, Japanese, German, Italian…it’s all there. Much of it is traditional regional street food, the noteworthy difference being the venue – a clean environment and rubbish bins, rather than the dirty litter-laden thoroughfares of many world cities. There’s a good range for vegetarian, vegan, and omnivore palates, with an emphasis on healthy, alternative and regional world cuisine. Some of it we’ve seen before, but it’s a great mix of familiar vendors and newcomers, throwing in a few stalls run by local restaurants. Quell the beast at The Hungry Hungarian or Double T for tacos and tortillas. 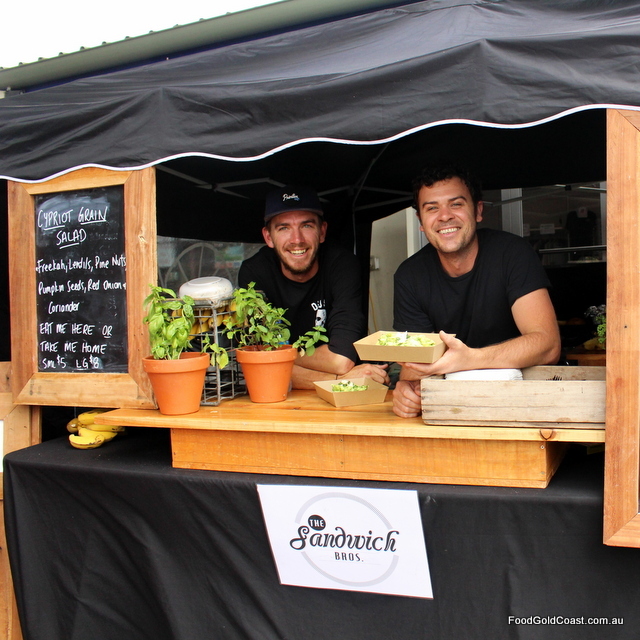 Vegans dwell in the Hungry Belly, have a Veggie Attack or dip into one of the raw food stalls. There’s an eclectic mix of woodfired pizza, gozleme, arepas, pad thai, quesadillas, sushi and gyoza, kransky, world burgers, even soft shell crab from Fingers and Bones! Let’s not forget sweets, located in the dessert hall! With seating for 450 and two bars to cater for thirsty patrons, this is casual dining heaven for everyone! Our favourite dining time is early enough to avoid the queues…Love it! Mudgeeraba Markets Shopping Centre, Swan Lane, Mudgeeraba. Every Friday – Sunday 8am – 2pm. Mudgeeraba has a real village feel which we love. It’s small enough to band together, yet large enough to enjoy some great facilities. 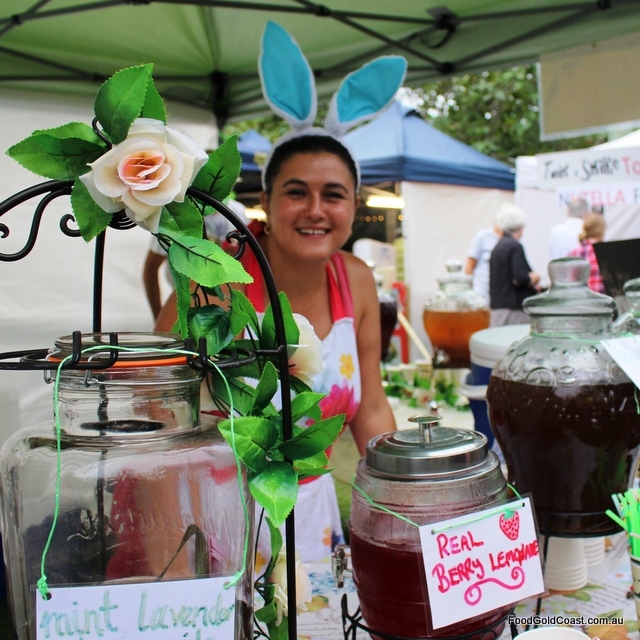 The Mudgeeraba Markets is held inside the local shopping centre over three days on the weekend. Already a welcoming, plant clad space, the courtyard comes alive when local growers sell their produce to the public (organic and fresh local on Friday and Saturday, organic on Sunday). “The tomatoes sold here have never seen the inside of a cool room. They taste so sweet you’d believe you were eating sweets,” Lesley, one of the market managers, tells us. We’re converts! Besides the boats on display and beautiful marina at Sanctuary Cove, there’s a heap of entertainment happening on market days for the kids: face painting with the Fig Tree Fairy Parties, pony rides, Music with Monica, a jumping castle and live music by Chantel Maree. Why not stop while you’re there and enjoy lunch with a view. Lavelle Street, Nerang. Sunday 7am – 12 noon every Sunday. 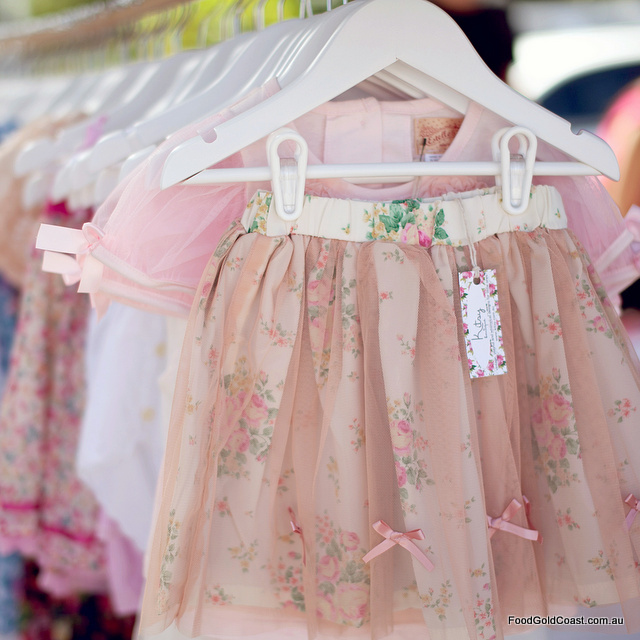 The Nerang Markets in Lavelle Street is a local favourite. We love the fact that it’s compact and clean, held in a closed off street, with plenty of parking in nearby streets. 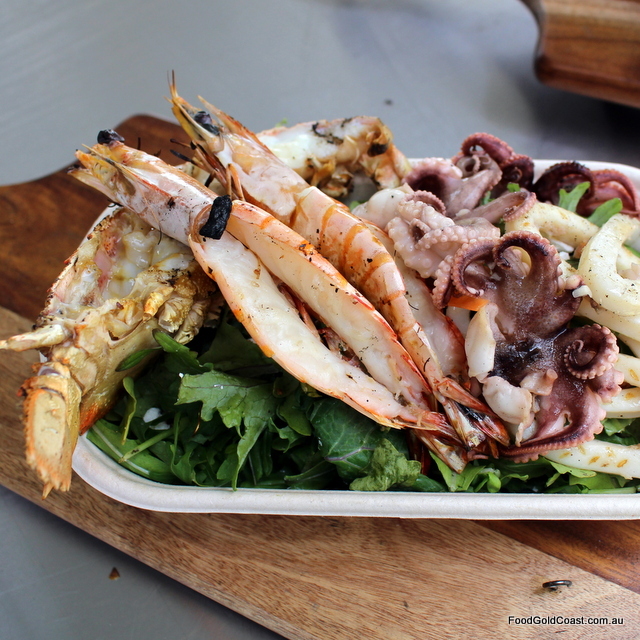 This is a mixed market with lots of fruit and vegetable sellers, some of whom are farmers, some specialty stalls with retailers selling seafood, meat, jams, cakes and breads, nuts and olives. 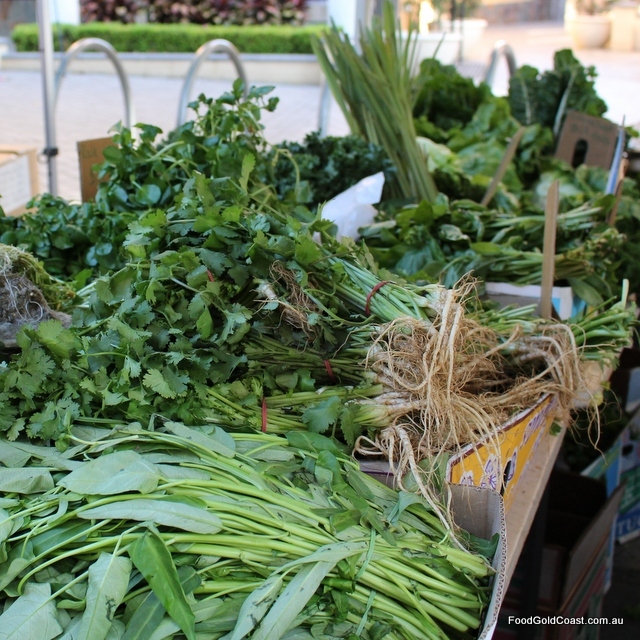 There’s a fair sprinkling of organic produce, however it’s not the main focus of the markets. There’s also a small range of handicrafts and clothing available. For breakfast, we tucked into a Brockwurst sausage and sauerkraut on a roll from German Sausages and a Banoffee Crepe from Magique Mouthfuls, checked out spices and nuts for sale and the stall of intriguing Turkish cuisine. Simply scrumptious! Eat as you shop or just enjoy a stroll up the stall-lined street. You’ll catch up with friends and make some new ones in this family atmosphere. NightQuarter, the city’s new culture and entertainment precinct is located on an empty block adjacent to the Helensvale Train Station. 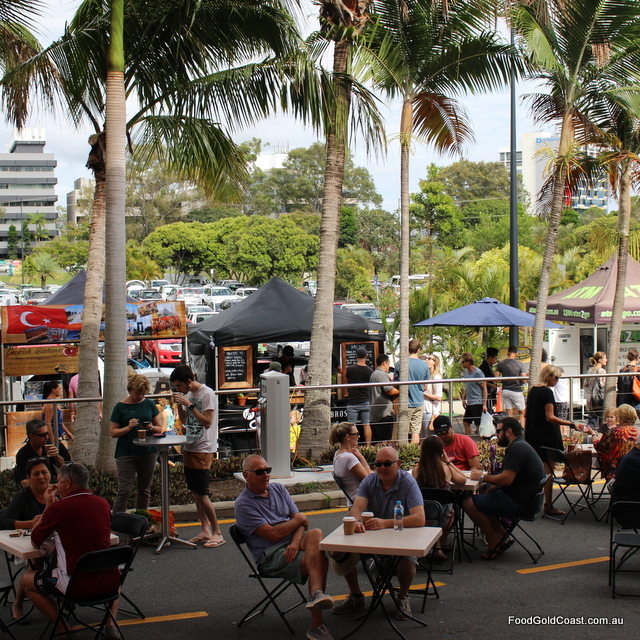 NightQuarter brings the Gold Coast our own ‘Eat Street’, music venue and night market shopping area all in one. With plenty of parking nearby and the light rail G:link Stage 2 approved to extend to Helensvale, NightQuarter is perfectly placed within easy reach. For the Gold Coast public, NightQuarter is a food, arts and entertainment precinct squarely aimed at the whole family. So much more casual than shopping in a centre, the night market experience provides a multi-purpose social experience involving the whole family – the choice of a diverse range of world food to please every palate, a children’s playground, exotic homewares and local artisan products, unique art, street performances and a showcase of local musical talent on stage. Palm Beach Currumbin State High School, Thrower Drive, Palm Beach. Every Saturday 6am – 11am (Summer); 6am – 12 noon (Winter). 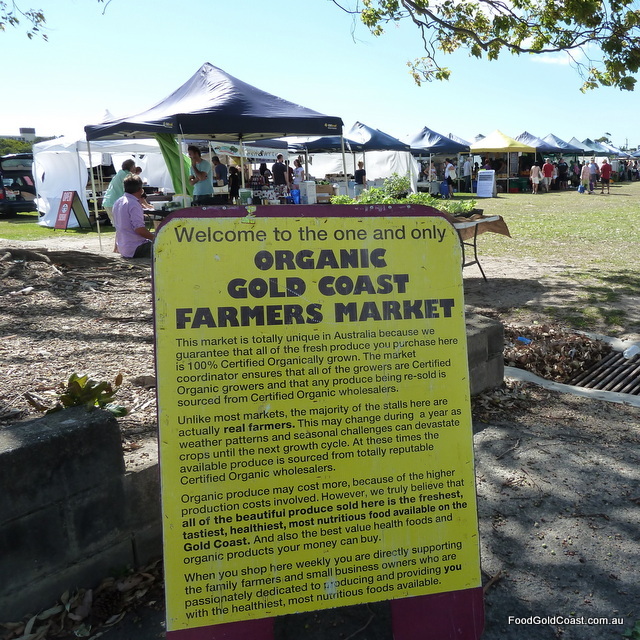 Palm Beach Farmers’ Markets is one of the most popular and easily manoeuvrable markets on the Gold Coast. Set in the school quadrangle of PBC, it’s arranged in an open square, with some stalls in the middle. 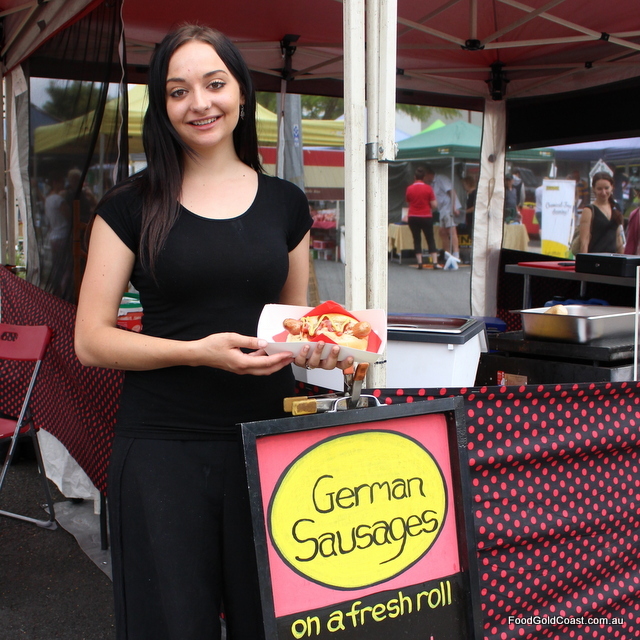 There are about 80 stalls that carry a great range of fruit and veg, gourmet deli goods, ethnic specialty foods, dried fruit, cakes and pastries, gelato, donuts and bread, meat and seafood, gourmet sausages, as well as food suitable for either breakfast or lunch. This market is popular with old and young alike, with many people buying breakfast to be enjoyed on seating under the shade of several Poinciana trees. Our tip is to shop early, as parking in the nearby streets can be tight. The Village Green, Currumbin Bird Sanctuary, Currumbin. Every Friday 4:00pm – 9:00pm. 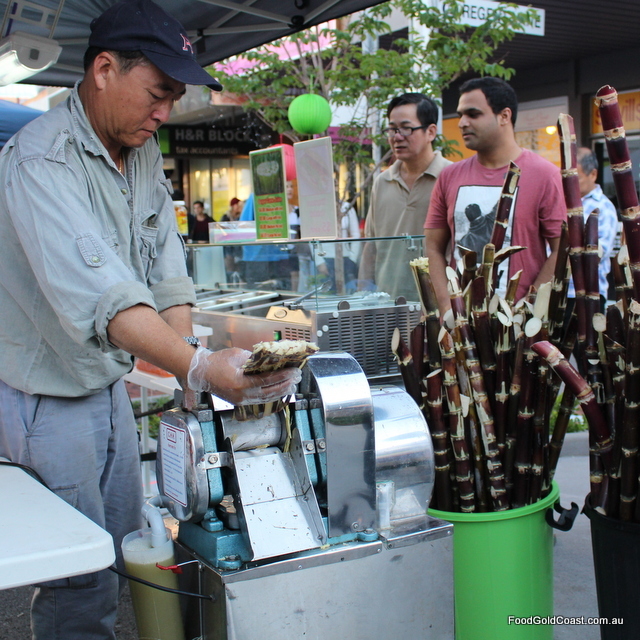 Every Friday night the Currumbin Bird Sanctuary Village Green is filled with street food from Vietnam, Japan, Thailand, Brazil, South Africa, Chile, India, Italy, Turkey and Greece. 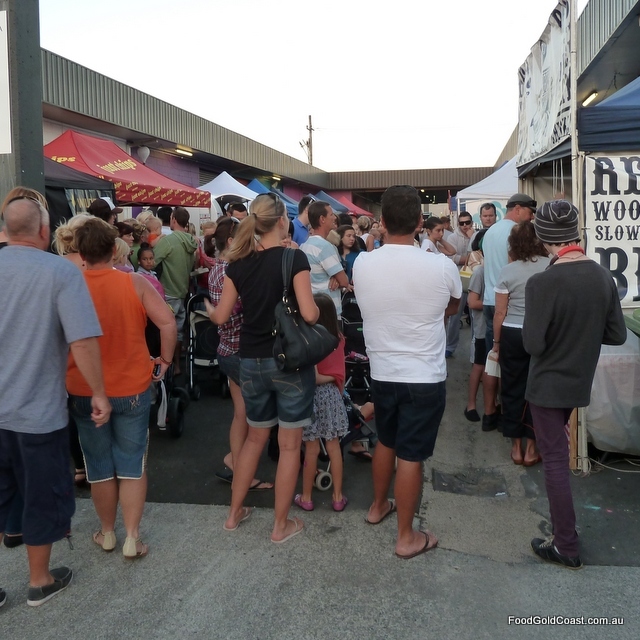 Fresh fruit and vegies are for sale in the spacious car park, arts and crafts stalls are housed inside, along with a bar stocking local craft beers from Burleigh Brewing and wines from Sirromet. The market has enjoyed a strong following since opening. When we visited recently, the Sanctuary’s veranda was packed with local families enjoying the live music. Some tourists, exiting the wildlife sanctuary at the end of their day, could also be seen stopping at market stalls to buy meals and fruit. We met as an extended family, each one having our own food preferences – vegans, gluten intolerants, dairy-free – yet everyone found interesting food which pleased them: Vietnamese bowl food, dim sum, pizza and sweets, with many more choices left to try another time. It’s an affordable night out for families, a place to socialise and meet friends and enjoy live entertainment with food to please every palate. The Esplanade, Surfers Paradise. Every Wednesday, Friday & Sunday night 4pm – 8pm. 5pm – 10pm September to April; 4pm – 9pm May to August. 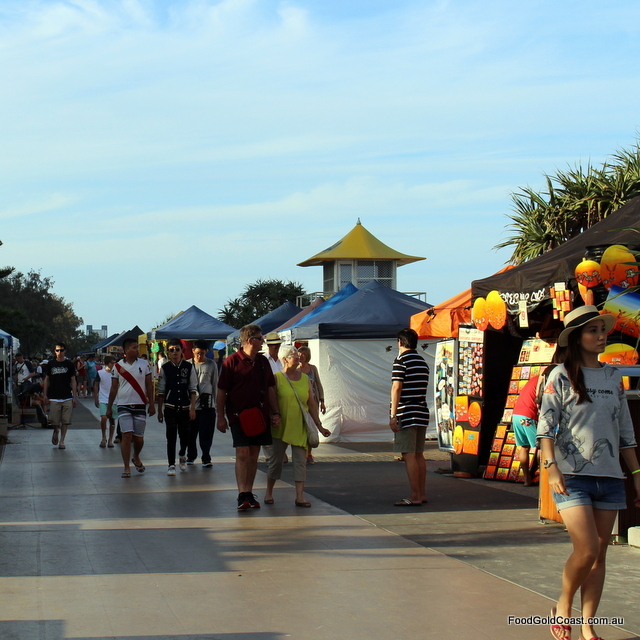 During late afternoon and early evening, The Esplanade along the beach becomes a hive of activity when a hundred or so colourful stalls set up for the Beachfront Markets. We find it interesting to take a stroll along the foreshore to check out the microcosm of life on the strip with a spot of crowd watching, to watch street performers such as Silver Steve (who’s busy doing nothing, literally), teens playing volleyball on the beach or tourists enjoying sand between their toes for the first time. While we’re there, we wander the stalls investigating new gizmos and gadgets, unique products and paraphernalia, buying presents for relatives overseas. The wares on sale are fairly touristy, carrying goods such as jewellery, home wares, fashion, beauty products and Gold Coast oriented tourist wares. While some of the goods are made elsewhere, the emphasis is on locally made or produced. We especially love the seashore-inspired jewellery and the beautiful metal-mounted photographs of Surfers Paradise by Geoff Edwards. Take a pleasant evening stroll with your family and dine along the foreshore while you’re there. 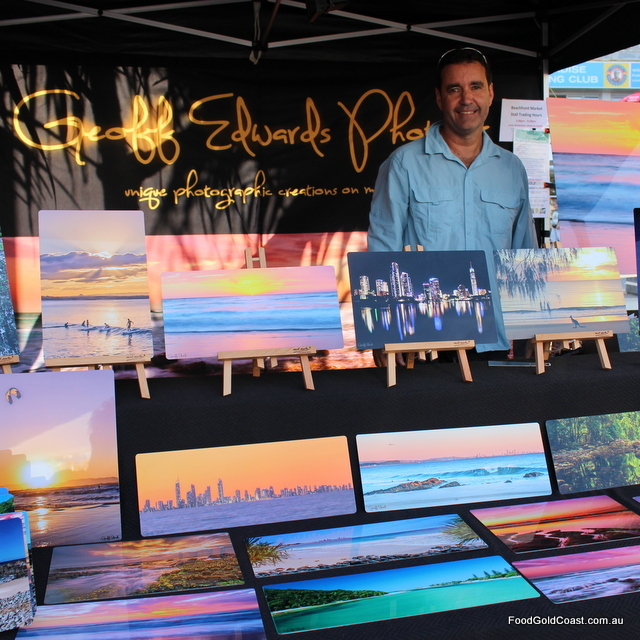 The Village Markets, Burleigh Heads State School, 1750 Lower Gold Coast Highway, Burleigh Heads. 1st & 3rd Sunday of each month, 8am -1pm. The Village Markets, Paradise Point Park, Cnr. The Esplanade & Ephraim Island Parade, Paradise Point. 4th Sunday of each month, 8am – 1pm. 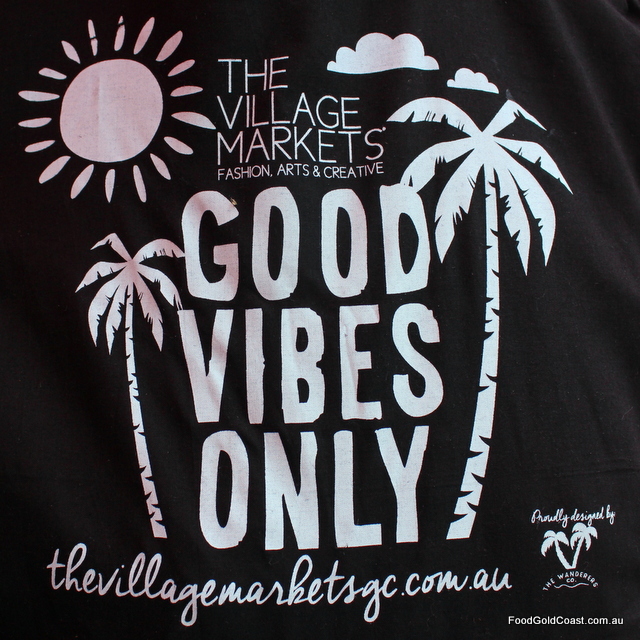 We always love visiting the Gold Coast’s original boutique creative markets, The Village Markets, because there’s a surprise around every corner. 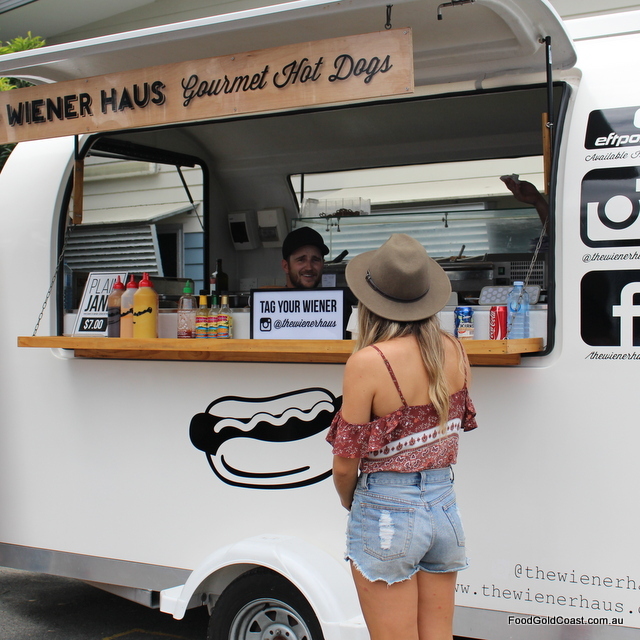 Started by Gold Coast entrepreneurs Marissa Bowden and Sarah Schoeller after both were made redundant from marketing jobs in the lead up to the GFC, TVM now has well over 100 stalls. There’s a great mix of arts, creatives, clothing, jewellery, cushions and candles, live music and gourmet food – a unique market that’s been a launching pad for so much creative talent! Although the Paradise Point TVM is smaller than Burleigh, it’s a great idea to combine a visit to the market with lunch in this beachy suburb. But wait, there’s more! 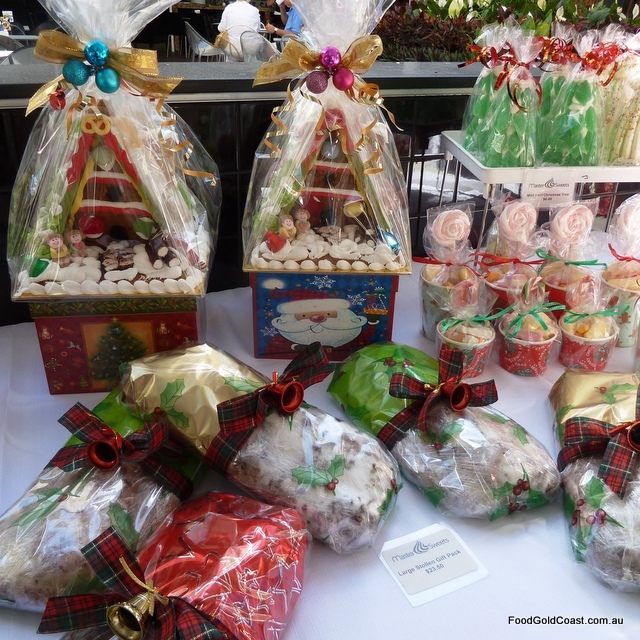 The Gold Coast Christmas Markets are held annually on the Broadwater Parklands at Southport in the week before Christmas. How gorgeous it will be on a balmy summer’s night, breezes drifting in from the water as we enjoy market eats together and stroll among the stalls looking at Christmas gifts and goodies. 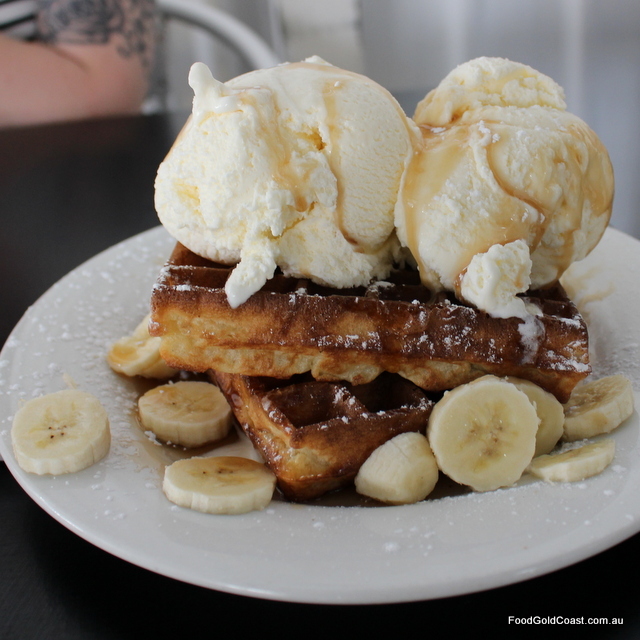 An earlier version of this post was published on More Gold Coast.